Believe it or not, Formula One drivers are real people, too. They have heroes and they can get awkward when faced with those heroes, just like the rest of us. Sometimes, it can be comforting to know you’re not the only person out there who brings up absurd subjects at the wrong time—sort of like Lewis Hamilton asking actual astronauts about the moon landing hoax while he’s visiting NASA. The people at APEX.ONE, a new transportation and mobility website from some ex-Jalopnik folks, have struck again. It’s a site committed to making high-quality videos and films—remember The Story of the Hypercar? 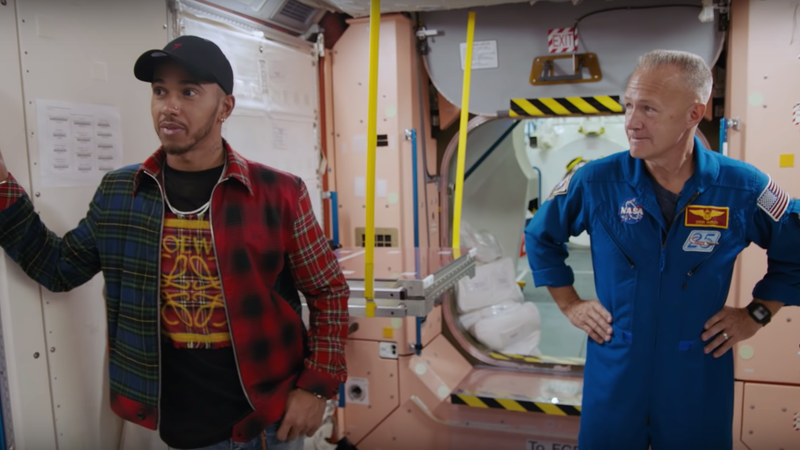 And they’re back again with a pretty great video of Lewis Hamilton’s visit to NASA. The visit wasn’t a sponsor event or a media drive—it was something that Lewis Hamilton did in his own free time ahead of 2018's United States Grand Prix because, like most of us, astronauts were his childhood heroes. He gets a comprehensive behind-the-scenes tour of NASA’s Johnson Space Center in Houston—including the International Space Station mission control, the Neutral Buoyancy Lab, and the ISS mockup—and he even gets a chance to take NASA’s Modular Robotic Vehicle for a spin. The highlight of the video, though, is that after completing most of his big tour, he takes advantage of this unprecedented opportunity to ask actual astronaut Doug Hurley about the moon landing hoax. “I guess it’s a touchy point, but the big question is—there’s the theories that you didn’t land on the moon. So... why would people have that theory?” Hamilton asks as he stands in the mockup of the ISS, because what else is left to discuss after you’ve had a chance to try on bits of an astronaut’s space suit? I can’t judge him, to be entirely honest. While I don’t think I’d actually, y’know, ask about the moon landing hoax after being treated like royalty in the Johnson Space Center, I would definitely, 100 percent be thinking about it. Maybe it’s the confidence to actually ask that separates the F1 drivers from the common folk. That said, the video is actually all kinds of incredible, and you need to take a few minutes out of your Monday to watch it. It’s a great look behind the curtain of one of the coolest organizations of all time.